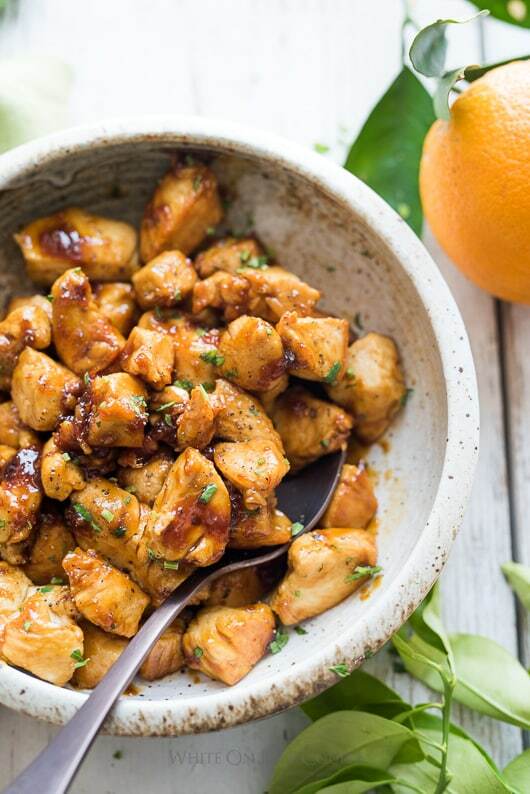 This easy recipe will make you never have to order orange chicken from a restaurant again! And it's much healthier. Make the orange glaze: Add orange juice, soy sauce, and brown sugar in a saucepan. Bring the mixture to a simmer over medium-high heat, stirring occasionally cook until the mixture is reduced to 1/2 cup and it is sticky and coats the back of a spoon, about 15-20 minutes. Stir in the orange zest. While the glaze reduces, cook the chicken in another pan. In another pan, heat oil on medium-high heat. Add chicken and season with salt and pepper. Cook chicken until cooked through and crispy on edges, about 3-5 minutes depending on how big your chicken pieces are. Garnish with cilantro or parsley and serve over warm rice, couscous or quinoa.